I’ve been trying to find people here who grow some of the own food in cities, that is, my fellow urban farmers. Because much of this is in private yards, I can’t get into the yards to see what people are doing. This is also early in their growing season. From what people have told me at gardening centers and botanic gardens, there is little winter gardening here, as it is too cold. But, yesterday as I was wandering around, I got a whiff of manure and my pace picked up. 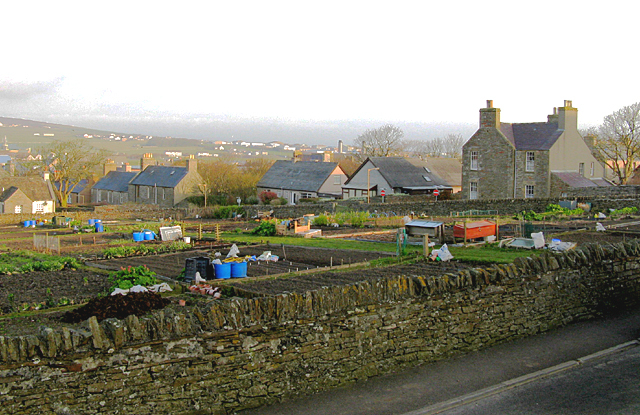 I found what looked to be an allotment garden, about 3/4 acre of gently sloping land surrounded by one of the ubiquitous stone walls and two locked gates. Looking over the gate I saw about 40 plots in various states of early-season tillage. The manure smell was coming from a big bag of fertilizer. Sadly, no people were there. Today, after our touring about to some very old sites of human activity (worthy of their own post), we got back to Kirkwall about 5 pm. My first place to go was the garden, and tonight the gate was open. 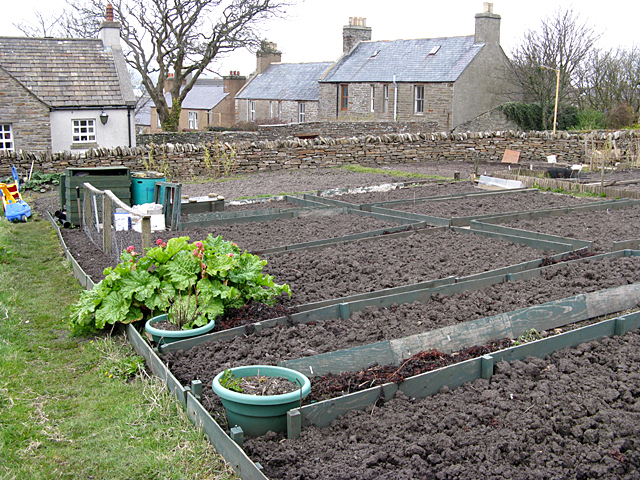 I let myself in and introduced myself to Norrie, a first-time allotment gardener. He lives about 100 yards away and is turning over his plot (about 15 yards by 15 yards) and digging out the overgrown grass by hand, after it was unused for several years. 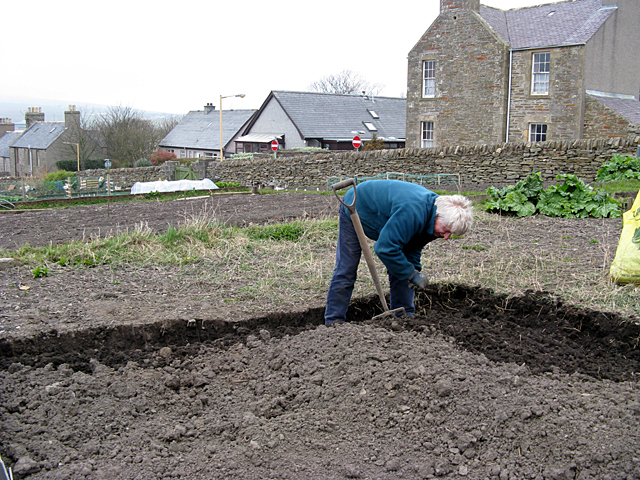 Because of this extra work he’s doing to clear the plot, he gets this year’s allotment for free. But the usual rate is £21 or about $42 per year. He plans to grow potatoes, onions and head cabbage, and to get a compost pile going this year. Next year he’ll start amending the soil with the compost. Check out all of those beautiful beds and that dark rich soil. Norrie may have his work cut out this first year as he preps his allotment, but he’ll still get great veggies out of it all.